What ever happened to MOB EXOTICS? Looking for information about MOB EXOTICS? We’ve moved! Our little local social networking group of exotic car owners and Italian car enthusiasts went national back at the start of 2009. You can still participate with other members at local, regional and national events. However, the biggest change is that instead of meeting up here to look for posts about weekly events, car club members get to chat online with other family and friends thanks to FACEBOOK. Yep — that’s right… the old MOB EXOTICS has it’s own Playing in Traffic Group on facebook –complete with a photo gallery anyone can contribute car photos to, a special events board, and chat between Maserati, Ferrari, and Lamborghini living friends (Fiat, Lancia, and Italian Motorcycles like Ducati and Moto Guzzi, too). Simply type http://www.italianizzato.com and it will take you right there. Click HERE to GET ITALIANIZED! You can subscribe to Kae’s EXOTIC CAR EXAMINER column on Examiner.com by visiting www.autopopnews.com, too. Fireball Run: The race to help parents find missing children across the United States is ON! IT’S AMAZING RACE MEETS MOTORSPORTS! The journey starts SEPTEMBER 23rd in HENDERSON-LAKE LAS VEGAS Nevada and finishes 8 days, 18 cities, and 3500 miles later OCTOBER 2nd at the luxurious resort community of GALENA, ILLINOIS! You are the Pawn and America is the game board. It will take more brain power than horse power to successfully navigate the country in this part rally, part game, part race. The adventure also incorporates adrenaline charged track competitions at the following locations: LAS VEGAS SPEEDWAY Las Vegas, NV; DODGE CITY RACEWAY Dodge City, KS; HEARTLAND PARK RACEWAY Topeka, KS; and CORDOVA DRAGWAY Cordova, IL! Want more information about how to register? For your viewing pleasure this holiday season. Do not try this at home. Ferrari owner and exotic automobile collector Dennis Gilligan might be best known in the car show circuit for his work with the Ferrari Club of the Mid-Atlantic Region and for hosting the annual “Gilligan’s Island Exotic Car Show” special event and fundraiser in Maryland for the benefit of Hospice of the Chesapeake, but in the real world he’s known as a land developer. This year, Gilligan was awarded a Lifetime Achievement Award from the Home Builders Association of Maryland for his consistently excellent work on land development projects along the Eastern Seaboard region. Not only has Dennis spent his life devoted to a passion for cars (and all things Ferrari), he’s been pioneering in his industry and spearheading green community projects. Congratulations to Dennis Gilligan (photo right) and family from Ferrari – Maserati and Lamborghini fans nationally and internationally for winning this prestigious award in the Mid-Atlantic region! With the ultimate design goal of creating “Sustainable Communities” in mind, the company’s land development projects attempt to maximize the use of porous surfaces and limit disturbed areas. As such, their unique professional team works for the betterment of the overall atmosphere, a lifestyle plus for modern humans that keeps local wildlife protected and plant species flourishing. Although MOB EXOTICS is no more, the friendships made there have continued to grow. Now expanded nationwide, the social networking group for exotic car lovers is still active and part of the exotic car community in Baltimore, Maryland and beyond. Join us by visiting http://www.italianizzato.com and feel free to keep a bookmark here at http://www.ferrarimaseratinews.com. COST: The event is free to the public; VIP passes are limited. TIME: Show hours are 10:00 am to 4:00 pm rain or shine. CAUSE: Viva Italia 2009 is an annual charity benefit car show raising money for the Childrens Guild, a non-profit organization that works with the most challenged and underprivileged of Baltimore, Maryland’s youth. PHOTOS: Click HERE to see photos after the show. VISITOR AND SPECIAL GUEST INFORMATION: Families with children are welcome. Pets are allowed on city streets with proper supervision for waste disposal and if on a leash. DISPLAY: Expect to see a dazzling variety of the finest Ferrari, Maserati, and Lamborghini cars in the Mid-Atlantic region. ACTIVITY: There will be an auction, so plan to bring your checkbook and bid accordingly! Drew Davis, Jack Davis, and Kae Davis will be on hand with friends from the Italianizzato Club, taking pictures and having fun talking with everybody. You’ll find them situated somewhere between a cherry vintage Ferrari Testarossa in Scuderia Red Tan traditional colors and a new white Maserati Granturismo or strolling the show talking with other club members, exotic car friends, and family. If you haven’t found the group, simply ask for Ms. Jeanette Scott of Scotty’s Garage (photo left). She’ll be the cute gal running the registration booth and tent — and is the volunteer auto diva event coordinator for the car show portion of the day’s fund raising activity. Jeanette, owner of the famous Baltimore Lamborghini named “Oro Toro” will know where to find more Italianizzato friends… as we’ll probably be hanging out someplace near her husband, the infamous car show gent “T.W.”, the man, the myth, the legend. Hope to see you at the car show! The Mercedes-Benz Lake Mirror Classic Auto Festival in downtown Lakeland, Florida is one of the most scenic and popular classic car events in the southeastern United States. Presented at beautiful Lake Mirror Park and throughout downtown Lakeland, FL, the 10th annual event is expected to attract over 500 show vehicles and 30,000 spectators. The event is presented FREE to the public. Legendary endurance racer, Hurley Haywood, is the Honorary Chairman, My Classic Car will be filming a segment with host Dennis Gage, and Bobby and Judy Allison will be attending as honored guests. Hurley Haywood has been described as a pioneer, a legend, and a one-of-a-kind driver. He has appeared in ads for upscale products such as Rolex and television productions for Porsche. Currently, he is the Vice President of Brumos Motor Cars, Inc. of Jacksonville, Florida and remains active as a professional race driver, despite stepping down from a full-time driving role in 2008. Hurley will continue to drive for Brumos in selected endurance races this season, including the Rolex 24 at Daytona. For all of the other races in 2009 he will continue working on race strategy and planning for the team. He also serves as Chief Driving Instructor for the Porsche Driving Experience as well as for Brumos U, the company sponsored driver familiarization school. Winning the 24 Hours of Daytona five times, the 24 Hours of LeMans three times, and the 12 Hours of Sebring twice has made Haywood one of the world’s most-accomplished drivers. He was the first to win the 24 Hours of Le Mans and the 24 Hours of Daytona in the same year. In fact, with a total of ten wins, he has won more endurance classics than anyone else in racing history. Hurley Haywood’s ability to consistently be smooth and fast, coupled with his knowledge of the racecars, has put him in the winners circle time after time. The 2009 season opener Rolex 24 at Daytona found Haywood back in a familiar place on the podium, as he co-drove the Brumos #59 car to a 3rd place finish. His level of experience and contributions to motorsports makes him a highly valued member of the Brumos team on all levels. The opening event of the Lake Mirror Classic is a Free outdoor concert and party held at the Lake Mirror Amphitheater on Friday evening. Over 10,000 people attend the Hot Rod Rendezvous enjoying rock & roll music, food and wild cars. When the band takes a break all the hot rods crank up their engines for the Hot Rod Rumble and make some music of their own. The Hot Rod Rendezvous benefits Junior Achievement of Polk County. Registration for the Hot Rod Rendezvous is separate from the Saturday car show. Vehicles must be pre-registered and the fee is $15 per vehicle . Hundreds of classic and collectible vehicles including Street Rods & Custom cars will be displayed on the streets of downtown Lakeland on Saturday. The cars are assembled in groups of similar makes and models in a 16-block area of downtown. Although the event is not judged, ribbons and prizes are presented to vehicles selected as sponsor favorites. Participants receive a Goody Bag from area merchants and event sponsors, a custom display sign for the vehicle, breakfast and lunch for two and event souvenir. Vehicle Pre-Registration fee is $40 ($50 after Oct. 1, 2009). The Lake Mirror Classic will include a “show within a show”. The Mustangs registered for the Lake Mirror Classic, which has historically been a display only area with opportunities to win sponsor choice ribbons, will be a separately judged class with trophies to the top cars. Two special trophies will be awarded to Best of Show Early Model and Best of Show Late Model. These two winners will be invited to join the Concours awards presentation at the Lake Mirror Park Amphitheater at the culmination of the show. The judged Mustang class is open to all years of Mustangs from ’64 1/2 to current. Stock, modified, race car, or anywhere in between, it doesn’t matter. So register your Mustang now and join fellow Mustang owners for a great day around Lake Mirror, Lake Mirror Park, and downtown Lakeland. The Lake Mirror Classic will conclude on Sunday morning with a fun road rally over the back roads of central Florida. Brunch will be served and prizes distributed at the rally’s conclusion. The driving route will cover approx. 50 miles. Registration is $30 per person. A popular feature at the Lake Mirror Classic is the distinguished group of classic wooden boats moored along the ornate 1920’s-era seawall of Lake Mirror. The classic boats present a stunning display adjacent to hundreds of classic automobiles. Participants receive a Goody Bag from area merchants and event sponsors, a custom display sign for the vehicle, breakfast and lunch for two and event souvenir. Vehicle Pre-Registration fee is $40 ($50 after Oct. 1, 2009). The Lake Mirror Classic also includes a category for antique motorcycles. Selected models are showcased on the terraced steps of the Lake Mirror Amphitheater adding a two-wheeled dimension to this classic event. Participants receive a Goody Bag from area merchants and event sponsors, a custom display sign for the vehicle, breakfast and lunch for two and event souvenir. Motorcycle Pre-Registration fee is $40 ($50 after Oct. 1, 2009). 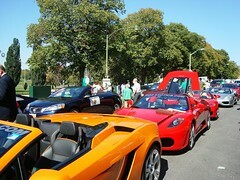 La Dolce Vita Automobili 2009 was a smashing success during Monterey Car Week! The Italianizzato Club and Kae Davis of AutoPopMedia.com by Connections Prep wants to thanks all the great exotic car show sponsors, volunteers, and vendors who also participated in making the festival such a success for the kids of the Shriners Hospital for Children. If you are reading here, cheers! Please show your support for the following businesses and professional organiations, and we’ll see you again in CA next year! Specializing in Exotic Vehicle Sales. The only exclusively Lamborghini Service facility in the US. Car Care, Detail Supplies, Garage Organization, Car Accessories. The finest selection of automotive and aeronautic books available anywhere. The motoring scene guide to automotive events and adventures. Automotive Traveler Magazine and AutomotiveTraveler.com allow you to indulge your passion for great cars, challenging roads, interesting people, and fantastic destinations. Find the car of your dreams. For over 31 years Car Collector magazine has been the leading authority in the collector car industry, supplying factual automotive articles to avid collectors and enthusiasts. CarProperty.com is here for Car Collectors, Car Enthusiasts, Race Fans, Race Track Administrators, Specialty Parking Facility Operators, Car Condo Operators, People in Large Metropolitan Cities and Automotive Business Professionals. Celebrating the Automobile… Past and Present From American Muscle to German GTs to Italian Supercars to Japanese Sports cars and just about anything that catches our fancy. ClassicDriver.com – the exclusive webzine with more than 5,000 luxury and classic cars like Aston Martin, Bentley, Ferrari and Rolls-Royce. Daily updated articles. Etceterini.com is dedicated to the history, documentation, and preservation of etceterini cars. By definition etceterinis are hand made small displacement Italian racing cars which were produced from the late 1940’s to the early 1960’s. Most of these beautiful cars used Fiat running gear and had their own chassis, hand hammered aluminum bodies, and engines. They raced throughout Europe in races such as the legendary Mille Miglia and also competed heavily in American SCCA racing. Whether you enjoy the do-it-yourself lifestyle, museum style, eclectic collector style, or something in between, Garage Style Magazine is all about your style! Store, organize and showcase your car photos. Monterey Car Week. August 10-16, 2009. Monterey, California. The one and only source for all event information during the internationally famed Monterey Car Week. Here you will find schedules for all your favorite events, local hotels and restaurants. Classic car news & events diary with features and video clips and thousands of classic and performance cars for sale, buying advice and car specs. All about the antique car – The daily magazine & marketplace dedicated to the pre-1940 car. The premiere automotive High-Definition (HD) video and photography site on the Internet. From vintage vehicles to muscle cars to modern imports and exotic sports cars. Also; videos of motorcycles, boats and speedboats, aircraft and pretty much…anything that involves speed and motion! It’s simple. Sub5Zero is dedicated to cars that go fast. The unique breed of autos that can reach 60 mph from a stop in under 5 seconds. The true test of an exceptional vehicle. The online magazine for French and Italian Classic Car Enthusiasts. Velocity Magazine is dedicated to the car enthusiasts of Orange County. Our mission is to create a community for these car enthusiasts by providing them profiles on distinctive cars and their unique owners. Velocity offers a perspective on Orange County and its car culture that can’t be found in any other publication. The world’s largest online community for people that love vintage cars. TheWeeklyDriver.com features the new car reviews of syndicated automotive journalist James Raia as well as other automotive content — industry news to TheWeeklyDriver.com blog. contact Cindy Meitle via email (Cindy@carprusa.com) or at (480) 277-1864. Just a quick reminder… click the link below for more information on the show.